Level one is the foundation for the Comprehensive Asset & Liability Management (C.A.L.M.) Asset Protection Plan. Approximately 99% of the clients who will purchase the C.A.L.M. program will NOT have a proper asset protection plan in place to shield their most valuable assets from creditors. Approximately 90% of the clients who will purchase the C.A.L.M. program will not have a proper estate plan to minimize estate, income and capital gains taxes, avoid probate and guarantee lifetime income for retirement. The C.A.L.M. team is made up of some of the best and most experienced attorneys, accountants, and financial planners in the country. 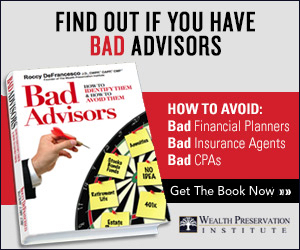 Each advisor who works directly with a client has been pre-certified by taking the Certified Wealth Preservation Planner course (CWPP™) and are “Rated” by the Asset Protection Society. 1) The client will be asked to fill out a questionnaire. This questionnaire will be the basis for the creation of a detailed Asset Protection Strategies Report indicating the problems with the client’s current asset protection plan or estate plan. a) the problems with the current asset protection plan and identification of possible planning deficiencies. c) suggested options for what could be done to mitigate income taxes, estate taxes and capital gains taxes. This report will be put together by your current CWPP™ advisors and reviewed by the creator of the CWPP™ and CAPP™ courses Roccy DeFrancesco, JD, CWPP™, CAPP™. If you are looking for value when spending money on advisors who can help you asset protect yourself and get your estate plan in order, you can not find a better value than by purchasing C.A.L.M. Plan – Level 1. To purchase a summary/report from an attorney/CPA/account/financial planner (assuming you could find one who knows the subject matter) would cost you at least $1,500 (and such a memo would not cover the many topics which will be covered in the C.A.L.M. memo. Part of the C.A.L.M Level 1 program is continuing education on the topics you need to learn in order to understand your risks and the solutions to protect your money. You will receive a monthly e-newsletter and periodic webinars as part of your fee for purchasing Level 1. These newsletters and webinars, alone, are worth the $495 fee for Level one. A great majority of the time a client once they receive the memo back illustrating how much help they need if they want to become asset protected or have their estate plan put in order, the client will want to engage a C.A.L.M. team member to do the needed legal work. The C.A.L.M. plan is designed to be very user friendly for the client by being less expensive and more efficient (due to the automation of the process). Clients will be able to receive discounted legal services typically charged by C.A.L.M. team members. Additionally, clients will be able to receive flat fee discounts when certain business entities are needed. For example, if a client has a brokerage account in his/her own name, it is obvious to state that the brokerage account is not asset protected by creditors. If that client wants to protect the account in a “domestic” manner, the client will most likely need a Limited Liability Company (LLC) or Family Limited Partnership (FLP) formed in the proper jurisdiction. The typical cost on the street by an asset protection attorney who sets these up is $3,000-$5,000+. Through C.A.L.M., clients can have the first LLC created for $2,500. For many clients, multiple LLCs are needed to protect real estate or other assets and depending on the complexities of the situation, further discounts for additional LLCs are available. When was the last time your estate planning attorney called your office to sit down and go over your estate plan? It rarely happens due to the fact that the attorney is too busy with new clients and making money on those clients. It is absolutely vital to have your asset protection and estate plan reviewed each and every year. While it is possible that your personal circumstances have not changed, it is also possible that you may have bought or sold property or stock, or had a life changing event that will require an alteration to your asset protection plan. It is also possible that changes in the law may require an alteration to your asset protection plan from one year to another. Someone on the C.A.L.M. team will be there to prompt you for your annual review.